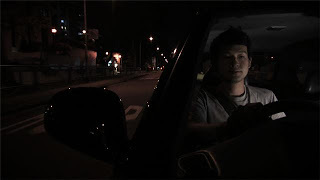 Actually (S) 439956 was first submitted to the National Museum for its Digital Homelands Project – a project in which any man on the street can document or make a film of a physical location in Singapore that they harbour strong sentiments for. Like his previous work 1920s, this piece is rich in visual imagery and gracefully shot as well. The film is literally a leisurely stroll with a newly-matured young man. Armed with a camera, he documents landmarks as well as moments. People familiar with the Katong area (near katong shopping centre) will know this place had a quaint and homely quality filled with corners and shops that surprise you. However, the boy (I mean, young man) also sought to capture some moments of a more contemplative nature like the balloon that drifted away from the grip of the girl's hands. Quite comically, it looked a little staged (in the way the man bumped into the girl). Also, like 1920s, the film drifts across many elements without something centrifugal to it. Perhaps for me, it was the chocolate tarts that anchored some feeling into it. I am somehow under the impression you cant get chocolate tarts in other HDB cake shops. Director's Bio: Born in HK, Elgin Ho was exposed to the film industry as early as 5 yrs old. He is currently pursuing his B.A. in Fine Arts (Digital Film Major) at NTU ADM. His previous short films, FOREIGN DREAMS & 1920s have made appearances in festivals around the world receiving numerous awards.